It is a great delight to join you at the groundbreaking ceremony of the ABP Royal Albert Dock. The docklands in east London was first built in the 19th century. It has always been the lifeline of Britain's business and trade. Over the past century, London docklands witnessed the prosperity of maritime trade, the rise of the City, and the boom of China-UK cooperation. Ten years ago, ABP started to prepare for this dock development project. As we Chinese often say, "Ten years' honing gets you a keen sword." Today, this sword is put to test. Four years ago, I had the honour to attend the signing ceremony of this project. 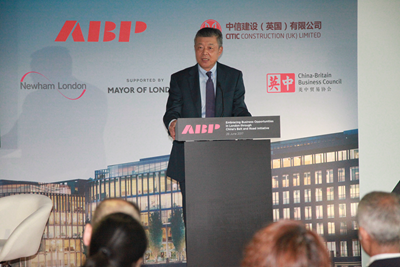 Today, ABP, joining hands with CITIC Construction, is setting out to develop London's third business district. In the coming years, this area will be turned into an urban complex of offices, homes and retail commerce. The historic Royal Albert Dock will be brimming with a new life. As diplomats, we follow the international situation closely. Today, the two most frequently used words to describe the current world situation are: chaos and changes. In the diplomatic language, these two words translate into "increased uncertainty and instability." The ABP Royal Albert Dock project is defying this description by providing China-UK relations with more certainty and stability. This project has signified that, between China and Britain, at least four things are certain and remain unchanged. First, the strong momentum of China-UK relations remains unchanged. President Xi Jinping's successful state visit to the UK in 2015 heralded the "Golden Era" of China-UK relations. During the visit, President Xi witnessed the signing of the agreement between ABP and CITIC Construction. There is no doubt that the ABP Royal Albert Dock project was one of the earliest "golden fruits" in the "Golden Era". Today, the project will break ground. This accentuates the steady progress of the cooperation between our two countries. It highlights the vigorous growth of our bilateral relations. Second, the immense enthusiasm of Chinese businesses for investing in the UK remains unchanged. In recent years, the business and trade ties between China and Britain have become ever closer than before. More and more Chinese companies have brought their investments and set up business operations here. Bilateral cooperation on infrastructure, equipment building, high-tech, new energy and financial services has gained strong momentum. Since the Brexit Referendum, investment from China has gone up rather than down. Huawei, Wanda, CGN and Geely, among others, continue to increase their investment in Britain. The ABP Royal Albert Dock project is just another example. This is the first green field project in Britain ever developed by a Chinese company. This is also the first large-scale project in Britain by a Chinese company with a mixed financing model. It is definitely a vote of confidence for the UK's future. Third, the huge potentials of China-UK cooperation on the Belt and Road Initiative remain unchanged. 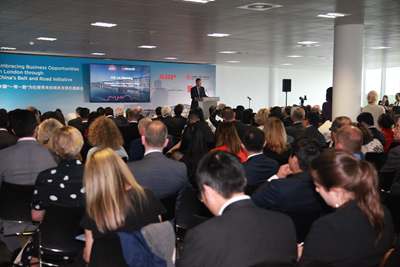 The ABP Royal Albert Dock project is a key project of China-UK cooperation on the Belt and Road Initiative. A month ago, the Belt and Road Forum for International Cooperation was successfully held in Beijing. Chancellor Hammond attended the Forum as Prime Minister May's personal envoy. During the Forum, China and Britain reached important agreement on advancing cooperation within the Belt and Road framework. Thanks to concerted efforts, our cooperation on the Belt and Road has become a new highlight of China-UK relations. Fourth, the win-win nature of China-UK cooperation remains unchanged. During the preparation phase, Chinese companies worked closely with the Greater London Authority. Both sides have aligned their respective strengths, laying a solid foundation for this project. The total investment of the project is 1.7 billion pounds. For the UK, this project will create a good number of jobs for London and deliver tangible benefits across the country. For China, it will help raise the management standard and increase the global visibility of the Chinese companies. This will become a new model project of China-UK win-win cooperation. This year marks the 45th anniversary of China-UK Ambassadorial diplomatic relations. It is also a year for consolidating the "Golden Era" of China-UK ties. Over the past four and half decades, trade and business cooperation has always been a "stabilizer" and "propeller" of our bilateral relations. 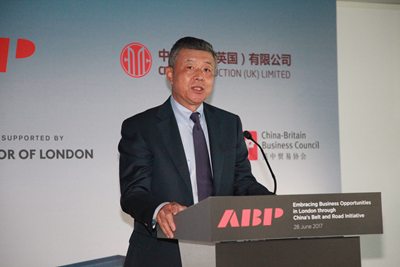 I sincerely hope that ABP and CITIC Construction will seize the "golden opportunity" of China-UK relations and work closely with British businesses to embrace the Belt and Road Initiative. I hope you will build a high-standard and high-quality project at the Royal Albert Dock and deliver more "golden fruits" in the "Golden Era".